Maybe the biggest obstacle that we encounter when we provide git trainings to our clients is trepidation: For one reason or another, clients are afraid to shred their source code while using git. Beginners have often heard rumours that it’s even easy to lose already committed source code using git. Others, mostly coming from SVN or SourceSafe, fear losing work that is only present on their own computers since changes don’t automatically get transmitted to remote servers with every commit when using distributed version control systems like git. Both these worries are unjustified, and can sadly keep new users from experimenting, which is the best way to learn git. Let’s see why we can git with peace of mind! Fear number one is accidentally losing commits, mostly when using git rebase instead of git merge when integrating changes (which we encourage). Let’s work through an example in detail. We are done rebasing, but on closer inspection, we’re really unhappy with how we resolved the conflicts. What now? We seem to be stuck with our results and the original commit contents are nowhere to be seen! The reflog shows the commits that HEAD (the checked out commit) last pointed to. 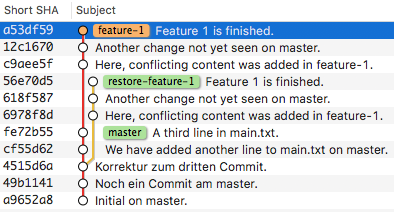 It goes quite a way back (the list is truncated here, but already goes back to before the start of feature-1), and we can still work with every commit that is shown here – we just don’t see them by default since they’re not pointed to by a branch or tag (a “ref” in git lingo). The reflog (or the whole repository clone containing it!) has to be deleted explicitly to lose this lifeline. So rely on it and rebase away – or just create the “safety” branch before even starting the rebase so that it’ll always be there for comparison. Unless you push it, nobody even needs to see it; that’s the beauty of distributed version control. (or discarding) a lot of branches has the same issue (and merging with SVN is a lot of work anyway). SVN users tend to commit rarely, and use few branches. With git, commit everything, branch where you want – just don’t push the results. Always having a checked in history locally gives a lot of safety. It may not be a remote backup, but in our experience, we’ve made a lot more mistakes that we wish we could undo safely than we had disks die on us. Lots of git hosting systems allow making personal clones (“forks”) of repositories. Where this facility is available, have a personal remote copy of the repository, and push to that. This provides a backup, and a place where you can e.g. selectively share refactorings with colleagues without muddying up the “official” history. Personal forks also facilitate a “pull request” based workflow, where you always push your changes to your own fork and ask another developer to “pull” the changes from there for review and integration. This seems bothersome at first, but is one of the few workflows that organically lead into code review. Reviews may take some time, but skipping them, in our experience, is a bit like saving time while driving by not checking fluids. All this said, there actually are some git operations that can destroy data in a way that cannot be recovered by using git’s tooling. if no option is specified at all) however overwrites the commit staging area (where changes get put when you git add them) with commit contents. git reset --hard overwrites both the staging area and the work tree (the directory with the files you edit directly) with commit contents. Staging area and work tree cannot be recovered, at least by git itself. git clean serves explicitly to remove untracked files (i.e., files not under version control) from a work tree. git clean -f deletes files, git clean -d removes whole untracked directories. Of course, untracked files cannot be restored from git commits. With these commands, great care is always warranted. git offers a lot of “safety equipment” in its tooling and organic workflows, but is not always obvious about it. While some exist, very few operations are truly unrecoverable however, so don’t fear experimentation, especially with already committed contents.